Part of walking with God is making a conscious effort to build your faith in God. 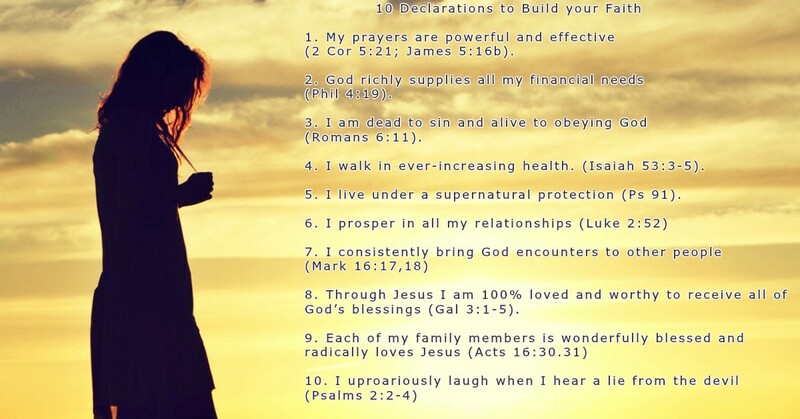 You can transform your life and change your world just by making these declarations. These truths from God’s word can help you build and maintain your relationships with God. These truths will bless, prosper and grow mankind in their relationships and you can use them to your advantage. Speak the word out loud to yourself every day and see your world transform. These words will help you in your walk with God, it’ll build up your faith in God and change the situations around you positively. Jesus said, “Man shall not live by bread alone, but by every word that proceedeth out of the mouth of God” Mathew 4:4. Say these every day for a month and see what happens in your life. My prayers are powerful and effective (2 Cor 5:21; James 5:16b). God richly supplies all my financial needs (Phil 4:19). I am dead to sin and alive to obeying God (Romans 6:11). I walk in ever-increasing health (Isaiah 53:3-5). I live under supernatural protection (Ps 91). Through Jesus I am 100% loved and worthy to receive all of God’s blessings (Gal 3:1-5). I uproariously laugh when I hear a lie from the devil (Psalms 2:2-4). Would you like to study the Bible and Pray with fellow Christians? then give us a CALL. If your life has been changed through this reflection, please do share your Testimony for a chance to feature on the website. If you know anyone who needs this encouragement, please share this Site. God bless you.